Do You Know What the Longest German Word Is? Rindfleischetikettierungsüberwachungsaufgabenübertragungsgesetz — Yes, German Is Easy! YES!!! This is an actual, real German word!!! So, you can imagine where the topic of this post is going to go — LOL!! BLOG POST PREFACE: While I complain here about how hard it is to learn the German language, I can understand how hard it is to learn English also. I mean you have a fox or foxes, but you do not have an ox or oxes, you have oxen! Living in a new country is exciting, thrilling, and challenging! The excitement and thrills come from seeing places you have only read about or seen on television or movies. It comes from meeting new people, and experiencing different cultures. But the challenge comes from experiencing this excitement and culture experience, while often comparing things to your home country, which in my case is the United States. And, when the country is one where the language is different than your native one, the challenges just compound. Instead of dwelling on the frustrations of learning a new language, it is best to accept that you need to learn the language to get by in your personal life. Even if it is just the basic greetings and asking for directions, taking the time to learn the language is extremely useful and satisfying. So, this brings me to the crux of this blog post. Learning languages for some people is very easy, while for others it is difficult. It is similar to those that can do and understand mathematics very well, and those that struggle. We are each different, and each of our brains are just wired differently. But, that does not mean that it is impossible to learn! Amanda and I have been living in Germany since January, 2013. Before moving, we took German classes for three months to learn the very basics. 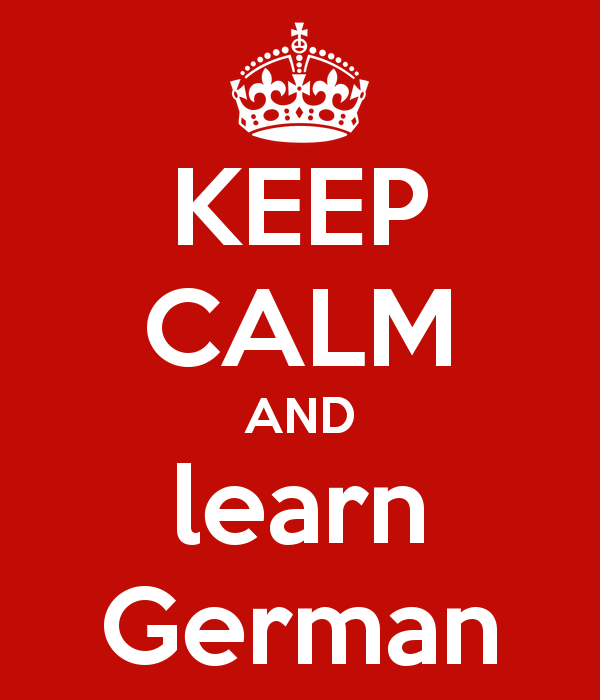 As part of our program, our company offers us each 120 hours of German language instruction. And, the past year, I have had personal one-on-one instruction 3 hours per week, which continues for 1.5 hours per week for the remainder of 2014. I have also studied the program Rosetta Stone, which helps, and have two complete German instruction courses downloaded to my iPod that I listen during my commute on the train to & from work each day. But, still I struggle. When listening, I can understand the general context of the conversation. I do get lost in the details, or if the conversation becomes very technical. I can speak the very basic statements when needing something or asking for something. But, am still a very long way to be able to put together back-to-back sentences in a complete train of thought without having to stop to think about what I need to say. Therefore, I find it very hard to learn a language, but at the same time very rewarding, as I can see my progress, no matter how slow it seems to me. Keep in mind that I have an engineering degree and an MBA, can understand (or at least I use to be able to understand) very complex mathematical and scientific equations, and computer simulations. Numbers, statistics, calculations, presentations….they are easy for me. But, I am also not a typical engi-nerd, in that I can use the other half of my brain too to be able to write or draw a pictures. In fact, I have been working on a novel for the past year, whenever I can find free time. But, learning a language is my challenge. If you have not attempted to learn German, well let me tell you, it is not completely that easy. While there are many German words used in English (e.g., kindergarten, gesundheit, angst, kaputt, halt), there are many words that are spelled the same way in both, but have completely different meanings (e.g., gift is poison in German, arm means poor, tuxedo means smoking). But, that is the easy part…Germans love compound words!! While English will have some, they are usually just two words together, like fisherman, headache, cowboy. Germans, well, Germans take this to a completely otherworldly level. For instance, numbers are written as one word. Example: the year 2014, would be zweitausendvierzehn (two = zwei, thousand = tausend, fourteen = vierzehn). This won the award for the ‘German Word of the Year in 1999’ and means ‘beef labeling regulation & delegation of supervision law’. Where the hell do you catch your breath in saying that!? And, the fact that there is a “German Word” competition, that should tell you something right there! If only confusing English/German words, compounds words, and learning German vocabulary were the reasons for the struggles, that would be great! But, there are three additional items that makes German very challenging…. 1) German has the same 26 letter alphabet as English, however there are four other letters (called umlauts) that have no real pronunciation equivalent in English. There are close ways to pronounce these as in English, but still there are slight differences. The umlauts are: ä, ö, ü, and ß. And, in English, they are normally spelled out as ae, oe, ue, and ss, respectively. (ß is technically not an umlaut, but I added here in the list). And a letter like ‘i’ is pronounced as ‘e’ and ‘j’ is called ‘yot’, and ‘y’ is called ‘upselon’. The word for ‘I’ as in ‘I am sick’, is ‘ich’. One does not pronounce this as ‘ick’, but you stop short of the ‘k’ sound and just push air out (hard to describe it). So, yeah, how one pronounces things is different…. 2) In English, there are 3 articles (the, a, an), and they are not dependent on whether or not the word is masculine, feminine, or neuter. The ‘the’ is a ‘the’!!! But, not so in German!! Each noun has its own article, which is either ‘der’, ‘die’, or ‘das’ based on whether the noun is masculine, feminine, or neuter. How to tell the gender of the noun? Well, there are general guidelines, but the key word there is ‘general’. Also, the der, die, das, can change to dem, den, der based on whether the noun is used as the subject, direct object, or indirect object (nominative, accusative, or dative case). Oh, and the fun does not stop there…oh, hell no!!! The equivalent of the English ‘a’ and ‘an’ are ein, eine, einem, einer, einen – based on noun gender and case too. And, lastly, this also impacts the ending of adjectives as well. For instance ‘gut’ means ‘good’ in English, but one does not necessarily just say ‘gut buch’ or ‘good book’. 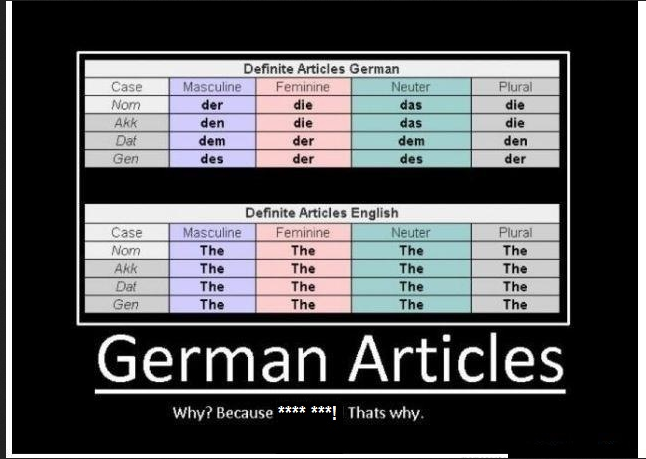 Depending on gender and case, it can be gute, gutes, guter, guten, gutem. Now, granted once you know the gender and case, you can determine which to use, but this is a lot to remember versus English, where the the is a the. 3) German grammar: Now, I like to think of myself as being fairly familiar with English grammar. I irk inside when I hear someone say, ‘I speak good’ – when it is ‘I speak well’. Also, in English, generally a sentence is structured with a subject, verb, direct object, indirect object. Example: I bought a book for school. I is the subject, bought is the verb, book is the direct object, and school the indirect object. And, in English, order is rarely changed. Look at the previous sentence, I started it with a conjunction, then an indirect object, next comes the subject and verb. Sometimes you can start a sentence with a verb, but in normal conversation, most people do not speak that way (it is subject, verb, object). Well, in German, it can be a bit dyslexic from English. You have subject, verb, object. But, then again, if you start the sentence with a word that means ‘because’ the order is subject, object, verb. Example literally translated in English: I love breakfast, because I eggs eat. If you start with a word that means ‘therefore’, an example literal translation is: I eat eggs, therefore have I eggs cook. But, no matter how much I may complain about how hard it is to learn German, what it takes is practice, unless you have the ability to quickly pick up language. I can pick up dialects like if I visit home in North Carolina USA, my southern American English accent comes out. A few weeks in New Jersey USA, I start looking for a phone to caul someone ova here. And, any time in Montreal, Canada, I come away with a French accent. But, learning German is coming slowly, and it just takes practice! Living in a different country, and learning a different language really gives me a great appreciation for those that have and are doing this. But, that is the subject of another blog post. A German once told me that the German language is the Lego of languages – because the words all stack together and build on top of each other.